This is one of the most traditional Southern Vietnamese dishes and the fish used is mainly from the Mekong Delta - such as catfish. You can also use fish such as seabass or salmon - catfish is better as it gets softer the longer you cook it which would therefore enhance the fish flavour in the soup. If I were to use bass, only add towards the end. My Method (this is how my mum tell me to do it). Over the years of trying to perfect this soup, I find that it requires a certain amount of love and attention. One time, (when there is love) it tastes like the perfect concoction. Do it mechanically, and you might as well have not bothered, no one will enjoy it. In hot pan, add all the garlic, onion and the catfish cutlets to brown with some fish sauce and brown sugar to caramelise. Then add the tomatoes & pineapple. Stir. Add Pineapple juice. Simmer with lid on. Add tamarind powder (for the sour), sugar & season with fish sauce. Keep watch and simmer, tasting and seasoning as you go along to make the perfect balance of hot, sweet and sour. Add any more seasoning ingredients as you wish. Remember that the herbs at the end will make most of the fresh flavour. After about 20 mins of simmering, the soup will almost be ready. 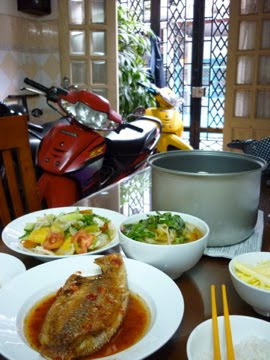 Serve one cutlet per person, making sure there is equal amounts of tomatoes, pineapples, okra, beansprout in each bowl. Served as a starter or with steamed rice - then you can dip some fish into fish sauce with some crushed chilli - this is a great meal - very healthy and wholesome. 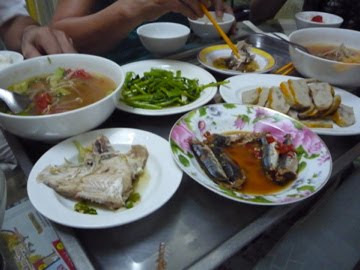 Traditionally, Vietnamese families share a big bowl that is placed on the middle of the table as an accompanying dish to refresh your palette, like pouring some in your rice bowl to clear up any left grains before you eat another bowl or at the end of the meal. You can make this with chicken, eels and shrimp, squid etc- its up to you. Its whats so great about this soup is that you can change it every time or you can use as little or as many ingredients as you wish. You just have to get that perfect balance of texture in the soft meat/ fish to the crunch of the beansprouts. The sweet of the pineapple with the sour of the tomatoes. The chillis kicking in with a sharp hint of lime. The herbs drawing it all in, holding together such a pleasurable taste of sunshine and happiness.